Garlic, Lemon and Tahini. 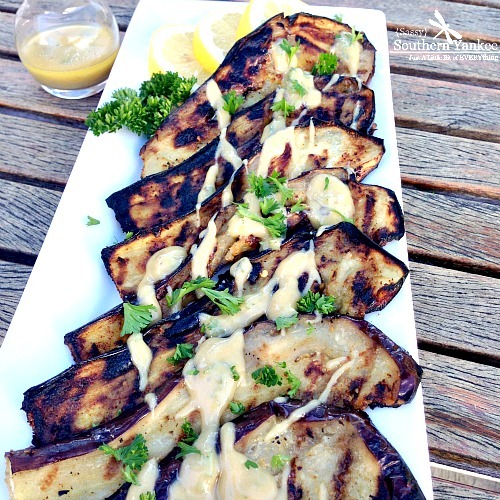 Whats not to love about this Garlic Roasted Eggplant with Lemon Tahini Dressing? This recipe is fresh and light loaded with tons of flavor. If you’re not a fan of eggplant or you’ve never tried it I can guarantee you this recipe will having you coming back for seconds. The best part is even though it’s loaded with flavor the dish is GF, DF, Whole 30 Compliant and Low Carb! SCORE! Garlic Roasted Eggplant with Lemon Tahini Dressing can be served hot or cold as a side or main course. I served mine with a bit of grilled marinated chicken and roasted tomatoes. Wash and dry the eggplants; then slice into 1/4-1/2 inch pieces. 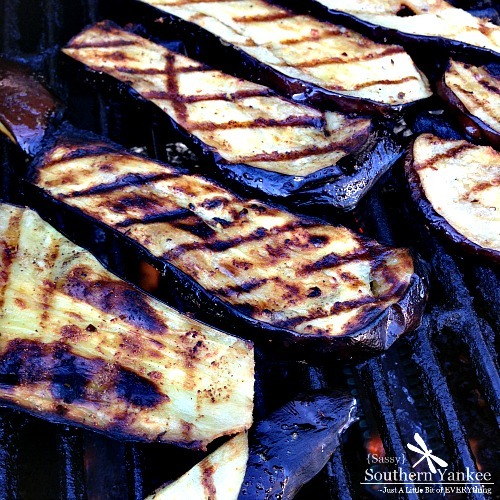 Salt the eggplant on both sides then set aside while you go and heat the grill. The salting will allow some of the moisture to be withdrawn from the eggplant and also reduce the bitter taste. While the eggplant is resting and the BBQ is getting hot lets work on the dressing! 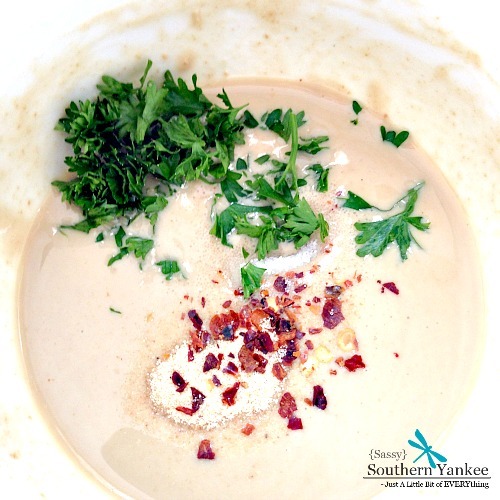 In a small bowl combine the tahini, lemon juice, garlic powder, rice wine vinegar, chili flakes and salt. Using a whisk combine the ingredients until smooth. If the dressing is too thick you can feel free to add a bit of olive oil or sesame oil to thin it out to the desired consistancy. You can add the parsley to the dressing or use it to sprinkle on top for a beautiful pop of color when serving. Ok, not that the dressing is done we are going to focus a bit of love and attention to the main attraction the eggplant. In a small bowl combine the olive oil and garlic powder; using a pastry brush or bbq sauce brush paint each side of the sliced eggplant with the garlic oil (Eggplant is like a huge sponge and will soak up the oil quickly). 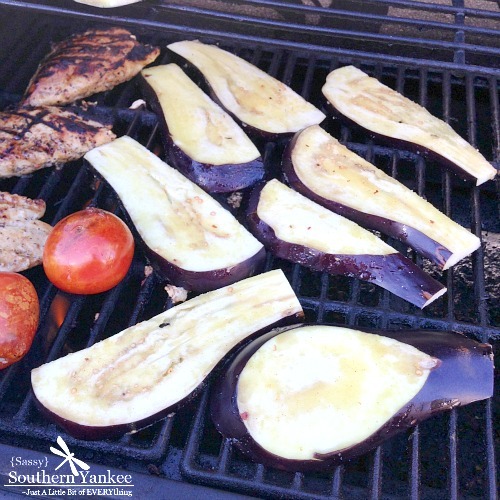 Place the prepared eggplant on the grill and cook for about 5 minutes per side until the eggplant is soft and has nice grill marks on it. Depending on your grill you might need to adjust the heat accordingly. Remove from the heat and drizzle with a bit of the Lemon Tahini Dressing. Vola! 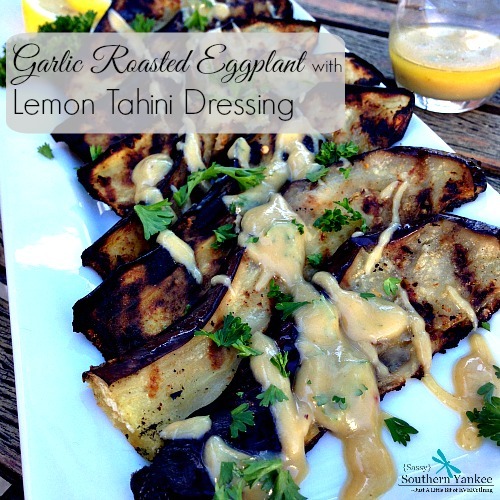 You have the best Garlic Roasted Eggplant with Lemon Tahini Dressing! 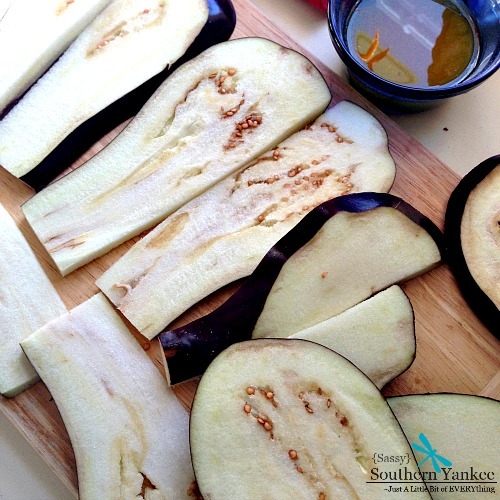 Wash and dry the eggplants; then slice into ¼-1/2 inch pieces. Salt the eggplant on both sides then set aside while you go and heat the grill. The salting will allow some of the moisture to be withdrawn from the eggplant and also reduce the bitter taste. While the eggplant is resting and the BBQ is getting hot lets work on the dressing! This entry was posted in Main Course, Side Dish and tagged BBQ, Clean Eating, Dairy Free, Eggplant, Garlic, Gluten Free, Grilling, Healthy, Lemon, Low Carb, Meatless Monday, Paleo, Roasted, Tahini, Vegan, Vegetarian.